Bottom line, you're not going to be keeping up with modern I4 1k's in a straight line. Biggest bang for buck is to go on a diet, lol! Both you and the bike. That being said, first thing I'd do is get the forks sprung for your weight and revalved. And set sag front and rear. Are you starting with a stock bike? The number one thing you could do is rider training. An expert rider on a small bike can outrun good riders on faster bikes. I would recommend not racing on the street though. Not a good path to go down. Consider doing a track day or race school. Judging by the question I'm assuming you mean in a straight line and if that's the case save yourself the aggravation (along with the money), sell the bike and buy something faster. Or you can drop 5 grand on an engine build to pick up 10-15 hp and you're still gonna get waxed just about as bad as before. You can upgrade the brakes and the suspension and do some stuff to pick up a little more power but if you're looking to run with modern 4 cyl. liter bikes anywhere but in the turns (and that's completely dependent on your skill level) you're missing the point of a Superhawk and bought the wrong bike. Where are you able to push the performance envelope of this bike on the street without it ending in great unhappiness? Tell us where, how you want to " run better with the cbr1000's" It wont really happen Bike to bike....but we might tell you where you can see some gains. Long time fire my reply, my only chance at ever beating/running with I4s is on a track with the twists. SH's are great City bikes bc if the twin torque power. I was beating many riders simply bc I push harder than them do even tho my bike is inferior. I'm thinking of making it a track bike mostly. start with good suspension. a good rear shock and well sprung forks on a track is worth 10bhp all day long. Suspension/brakes first for sure. Shifter lever mod also adds 7-10hp.... all day. I am running a new motor and on my old motor which is sitting on the workbench has in it the factory pro shift kit. I miss it very much and will someday soon take it out and put it in the new motor. I am not so sure of the Kevlar clutch that I installed with only 600 miles on it but seems funky at times. So long story shorted up waiting until my decision on the clutch until I do the swap as I might swap the clutch at the same time. also why you are in there you might as well put the ignition advance in. Do F4I calipers bolt on, or is modification required? 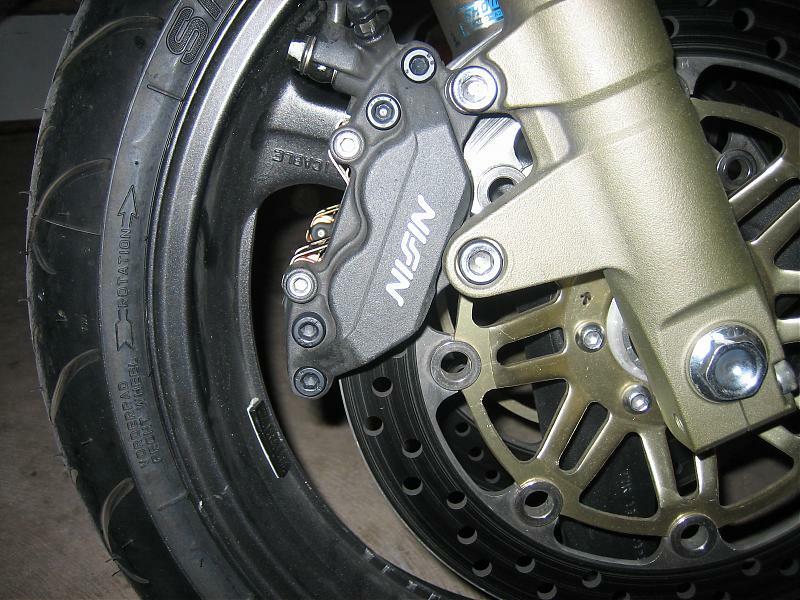 The caliper itself needs a little clearancing where the bottom fork tab is. As noted there is a bit of interference.. most cut the caliper ..I took a different approach and removed 1/2 the needed clearances off the caliper and 1/2 off the fork leg. What is the benefit with fitting the f4i calipers? More power, control and safety due to stronger brakes. Stronger brakes mean wider area of impending lock up more control of stops. 100% worth the mod since you sell your brakes to make up cost. Only better improvement is a whole cbr front end. I understand, but what makes the difference between the front calipers on the VTR vs the ones on the F4i? 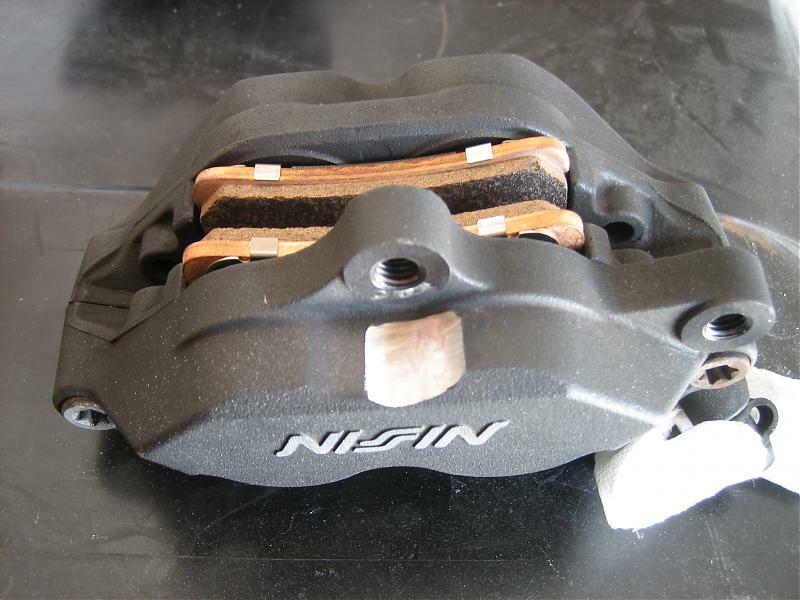 They seem quite similar, both Nissin, both 4 cylinders per caliper... could it be that the f4i calipers pistons have a greater surface? If so, could you tell what are the actual numbers? Already got a new set of steel braided lines waiting to be installed, those alone (and surely, new fluid) will probably give a big improvement. Different piston sizes. I swapped to the f4's and noticed a huge improvement, combined with ss lines and ebc hh pads. I feel my hawk has all the stopping power and modulation I need (track days included).